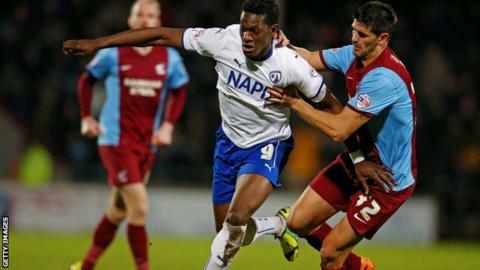 Chesterfield showed the form expected of League One play-off hopefuls as they outplayed fellow contenders Port Vale. Armand Gnanduillet timed his run just right to power home a 13th-minute header from Romuald Boco's left wing cross. Top scorer Eoin Doyle netted the second from the penalty spot on the hour after being brought down by Freddie Veseli. Charlie Raglan then headed home Jay O'Shea's corner to settle it with the third goal on 70 minutes. But the Spireites, who remain in seventh place in League One, could have won by more. Gnanduillet was only denied a second goal when he danced through the Vale defence, but keeper Chris Neal narrowed the angle to thwart him with a good save. Chesterfield chose the occasion to honour former striker Ernie Moss, 65, their all time top scorer.Moss, who had three spells at Chesterfield in his 749-game career and also played for Vale, was diagnosed in October with Pick's Disease, a form of dementia.As part of an attempt to raise funds to help raise awareness of the condition, he was there at the Proact Stadium with his family to witness the meeting of two of his former clubs. And Vale old boy Sam Morsy's well-struck long-range shot was tipped wide at full stretch by Neal. Ben Williamson did hit the bar for Vale, whose biggest defeat under Rob Page drops them three places to 11th. But any hopes of a second-half fightback were ended when Doyle was brought down by Veseli to secure his side's sixth game without defeat. The country's reportedly much-sought-after top scorer got up to send keeper Neal the wrong way with his 23nd goal of the season. "A great team performance. A lot of good individual performances, we got a few goals and everyone is delighted with what we've done. "I've always felt we'll score goals late on in games because of our energy levels. "I'm a bit disappointed we didn't get another goal or two late on because Port Vale were very stretched in the game but all in all it's a good performance from our lads and we're pleased with the three points." "There's been very few occasions since I took over when I've had cause to be disappointed, but the players know I'm not happy with them. "For whatever reason, two or three were off their game and it had an impact on the entire team. "But when we lost at home to Coventry, we then went on a run of three wins in four games and there's no reason why we can't do it again. It's how we react that counts. "I know what I've got in that changing room. Nobody turns up and tries to give a bad performance. Now we just have to work our socks off on the training ground next week and bounce back." Match ends, Chesterfield 3, Port Vale 0. Second Half ends, Chesterfield 3, Port Vale 0. Sam Hird (Chesterfield) is shown the yellow card. Attempt blocked. Dan Gardner (Chesterfield) right footed shot from the right side of the box is blocked. Attempt missed. Colin Daniel (Port Vale) right footed shot from the centre of the box is close, but misses to the left. Attempt saved. Achille Campion (Port Vale) right footed shot from the right side of the box is saved in the top right corner. Attempt missed. Dan Gardner (Chesterfield) right footed shot from outside the box misses to the right. Substitution, Chesterfield. Dan Gardner replaces Armand Gnanduillet. Ben Williamson (Port Vale) hits the bar with a right footed shot from outside the box. Goal! Chesterfield 3, Port Vale 0. Charlie Raglan (Chesterfield) header from the centre of the box to the bottom left corner. Assisted by Jay O'Shea with a cross. Corner, Chesterfield. Conceded by Chris Neal. Attempt saved. Jay O'Shea (Chesterfield) left footed shot from the centre of the box is saved in the centre of the goal. Attempt missed. Jimmy Ryan (Chesterfield) right footed shot from outside the box is close, but misses to the left. Attempt blocked. Achille Campion (Port Vale) left footed shot from the centre of the box is blocked. Substitution, Port Vale. Achille Campion replaces Louis Dodds. Substitution, Chesterfield. Jimmy Ryan replaces Ritchie Humphreys. Attempt saved. Sam Morsy (Chesterfield) right footed shot from outside the box is saved in the top right corner. Penalty conceded by Frederic Veseli (Port Vale) after a foul in the penalty area. Goal! Chesterfield 2, Port Vale 0. Eoin Doyle (Chesterfield) converts the penalty with a right footed shot to the top right corner. Corner, Port Vale. Conceded by Sam Clucas.